Whitehall Personalized Two Sided Post Sign - - 2 sided sign holds the same personalization on both sides. Made in USA. 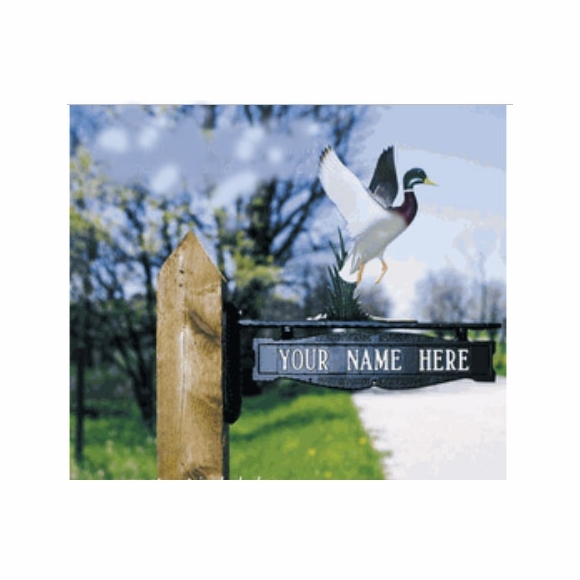 Optional ornaments designed for this sign are sold separately (shown here with duck ornament; see Related Products). Post not included. Select one line or two lines of personalization. Personalization guidelines: Use line 1 for your name. Use optional line 2 of a two-line sign for the address. Dimensions for 1-line post sign: 14.5"W x 3.5"H.
Dimensions for 2-line post sign: 14.5"W x 5.25"H.
The L bracket for the post sign is 16.5" long x 7.5" tall x 2" wide. Does not include any hardware. Colors: black with white reflective characters as shown above, AB antique brass; AC antique copper; BG black with gold characters; BS black with silver characters; BW black with white characters; GG green with gold characters; OB oil rubbed bronze; OG bronze with gold characters; PS pewter with silver characters; RG red with gold characters; and WG white with gold characters.